Shake well before using. To be used as a prespray for soiled carpets. Product should be extracted after use. It can be used on all synthetic carpets, including 5th generation nylon. 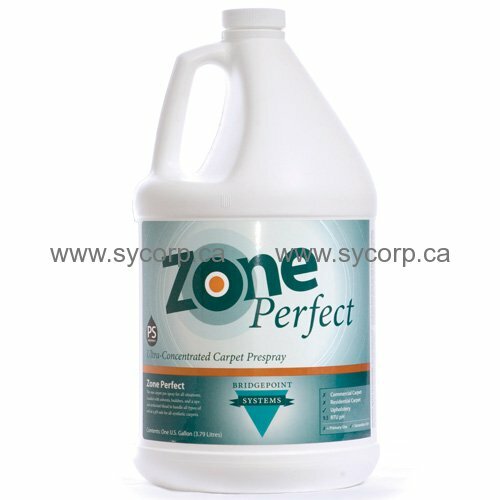 Zone Perfect is designed for use in the Hydro-Force sprayer and other types of pump sprayers. For use with Hydro-Force Sprayer: Dilute 1 part Zone Perfect to 1 part water in the 5 quart container. Set the sprayer at a 1 to 16 dilution. For use with regular 1-8 Hydro-Force, dilute 1 part Zone Perfect to 3 parts water. Do not allow carpet to dry before extraction. For use with Pump/Electric Sprayers: Dilute 4 oz. Zone Perfect to 1 gallon hot water (1 to 32). For exceptionally heavy soil, dilute 6 ounces per gallon (1-24). Spray until carpet is damp. Extract with your normal process. Do not allow carpet to dry before extraction.